What do you say when the backup late night host on a basic cable network buys you an aspirational Korean luxury car? 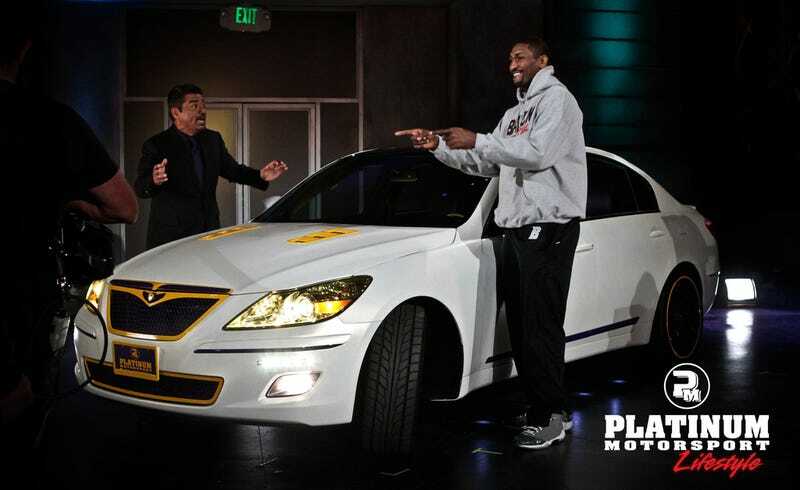 Welcome to a day in the life of Ron Artest, who was given this awful "Lakers edition" Hyundai Genesis by forgotten late night host George Lopez. This all happened back in March, before LA gave up two games to Dallas in the playoffs, but because it happened on the George Lopez Show none of us found out about it until today. Apparently Lopez said he'd buy Artest a Rolls Royce but Artest said all he needed was a "Hyundai." Lopez split the difference and gave him a tastelessly modified Hyundai Genesis sedan that looks sort of like a Bentley. Platinum Motorsport upgraded the car with a yellow-flake paint, gold-rimmed grille, and yellow-look headlights. The interior has a Bugatti Veyron-esque fill pattern on the seats with yellow-on-purple leather inserts everywhere and Lakers floormats. What's worse here: the fake yellow hood vents or the yellow-rimmed purple wheels? To give credit to Artest he's been driving the car around. Of course, Artest will drive anything.